Drain the swamp and make America great again. Let me repeat it. Drain the swamp and make America great again. 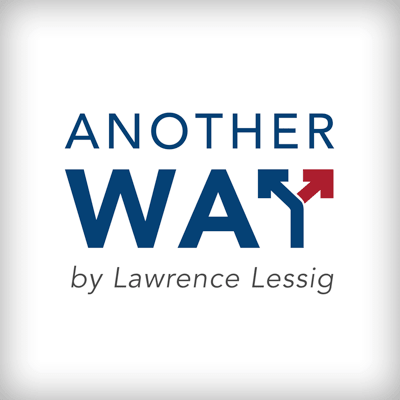 This is Larry Lessig and this is the fifth episode of this podcast, Another Way. In the first, I described what everyone should know: that America has become ungovernable, and that 2020 won’t fix that unless we change what that election is about. In the second, I explained why the politicians can’t fix it unless we force them with a different kind of politics. In the third, I introduced the first part of that different kind of politics, a strategy involving Congress. In the fourth, I added the second part, a strategy involving the President, and sketched the reform that both parts together have to be fighting for. In this episode, I describe the strategy of the campaign for President that would be necessary for that campaign to win. What would the platform be, and how could it work? I think the answer’s pretty obvious: we would win by stealing Donald Trump’s words while changing their meaning. The campaign to defeat President Trump and to reform this democracy must be led by candidates who make two simple promises: first, drain the swamp; second, make America great again. I get it, that sounds like a joke, but it most certainly is not. The first plank leverages the common ground that links the Left and the Right in America today. We all want to drain the swamp. Indeed, that slogan was originally not even Trump’s, it was Nancy Pelosi’s, perhaps less believable in the hands of the number one fundraiser for the Democratic Party. It is a view she knew Americans believed and, as Trump has now proved, Americans on the Left as well as on the Right. Trump came to see the value in this slogan, but it’s not clear he ever actually believed it. He said he thought it was cheesy at first but when he tried it, the audience erupted in cheers. The candidate had tripped onto a goldmine of political energy, primed by the constant attack that Bernie Sanders had leveled against Hillary Clinton and fueled by the view of most Americans that, indeed, their government was corruption everywhere. Now, of course, as President, Trump has done literally nothing to drain the swamp. His administration is widely considered to be the most corrupt in modern history. His self-dealing is legendary, his cronies’ self-dealing is likely criminal, and he has literally proposed not a single change in law that would address the “swamp” that he promised to drain. Yet those failures are an opportunity. Trump rallied America and then let America down, and if there is a single message that could win over the disappointed it is the message that affirms what they already believe, and yet convinces them that this time their beliefs would be respected. This first plank is thus a fight for unity, a rallying call that says to every American: you believe this already, now let us make it happen. The second plank is not a fight for unity, it is a declaration of difference. For to say “make America great again” in 2020 is to say something very different from saying it in 2016. The commitment in 2020 is to repair the extraordinary damage that this inept and pathological man has done to America in the years since his accidental victory. It must declare openly and firmly that the policies of hate will end. It must affirm a commitment to peace. And it must commit to the decency and respect of the immigration policies of even Ronald Reagan, not to vilify fabricated enemies but to be the “shining city on the hill,” one that welcomes and encourages the world to the values of freedom and equality that we were taught America was born to defend. Because no doubt there are Americans who look at the America that Trump is crafting and celebrate as there would be in any nation in any part of the world, but equally, without doubt, there are many more Americans who look to his hatred and ignorance and are just repulsed. The vast majority of America supports immigration and inclusion. The vast majority reject hate. And the vast majority of Americans want to be that city on the hill: a nation that can inspire the world not by building an ever more powerful death star but by creating and innovating, and changing the world, by standing for values of freedom and justice, the values my grandfather fought for in the Second World War. Yes, there are “deplorables” in America today as in any nation anywhere in the world. But the people who elected Trump because they believed he would drain the swamp are not deplorables. They are the Americans who are frustrated and angry with the failure of this government. They are us and Trump does not own them. Instead, we need to recruit them back to the fight that could actually fix this democracy. And we do that not through ridicule but through the respect and understanding that every citizen deserves. Now, I know that won’t feel satisfying to many. The insults of this President need to be answered. The hatred needs to be rejected. The very act of acknowledging common ground seems like compromise. Why should we compromise at all with the devil? Because he is not the devil. He is a clown. And while we must affirm without qualification the values he rejects, we must acknowledge without hesitation the truth and goodness in the many who found themselves drawn to him. They were right to believe the swamp had to be drained. They were right to believe that it would take an outsider to do it. And now that Trump has shown them that he never meant anything he said about swamps and reform and a million other issues, it is time we say to them: join us. Convert to the Left if you want, but that’s not our ask. Our ask is just this: convert to a cause that is bigger than Left versus Right. Join the fight that every American soldier has engaged in since the beginning of this Republic, not for Republicans or for Democrats but for country and democracy first. There’s just one more episode to come. Stay tuned till the end.